Phoenix rupicola growing plam tree of the genus Phoenix and also known as Cliff date palm, Date palm perennial tree and also used as ornamental plant, can grow in mediterranean, desert, subtropical, tropic climate and growing in hardiness zone 9-11. Leaves size 1-3 m (3-10 feet), and the leaves are with spiny edge. Flower color yellow, the flowers grow on branch on every branch can be dozens of flowers. Fruit color can be red-black in oblong shape the taste is sweet. Phoenix Rupicola Cliff Date Palm Seeds! 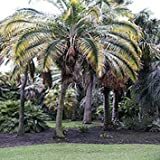 PlenTree Phoenix Rupicola Cliff Date Palm Seeds! When does Date palm bloom? What can be done with big quantities? How long does it take for bear fruits?